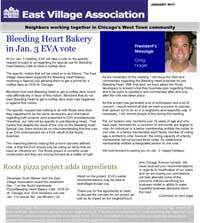 A rooftop deck for the planned Bleeding Heart Bakery Cafe will face a Jan. 3 East Village Association membership vote. Read more about the bakery and adjoining pizzaria at Chicago and Winchester, and check out photos from the East Village holiday party, in the January 2011 issue of East Village News. Download it here. Happy holidays!